Do any of you remember those tangy, sweet juice pouches Capri Sun? My teeth hurt just typing that sentence! I used to beg my parents to put them in my lunch box so I could be as cool as the other kids (90’s flashback!). Little did I know as a child that Capri was not just the name of my favorite juice pouch, but also the most amazing little Italian dream of an island located not far off the breathtaking Amalfi Coast. Eric and I began our short journey to Capri across the Bay of Naples from the town of Sorrento via ferry (40 mins to be precise). 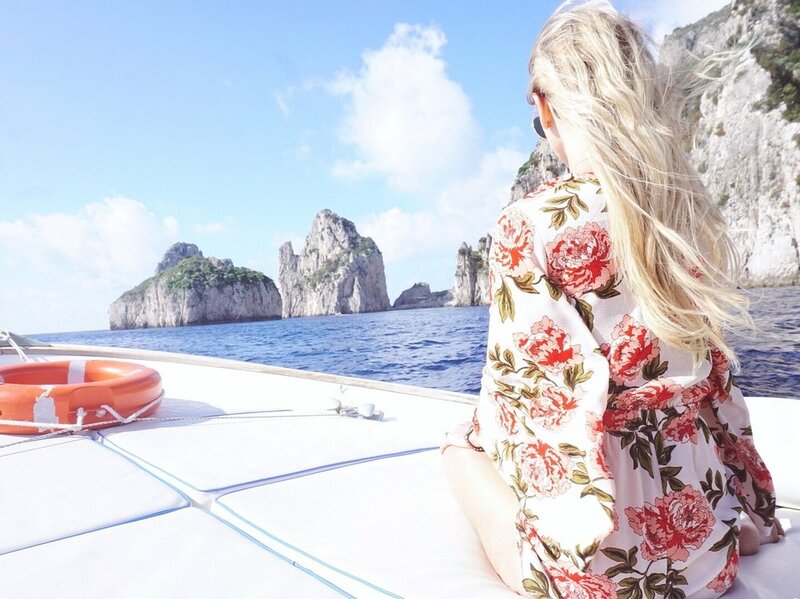 We decided to do a day trip to Capri, but if I could do things over again, I would have stayed over night, as it was so charming and romantic. I was completely enamored by the enchanting island and its surroundings. We only had about 6 hours and quite the agenda planned (if you know Eric and I personally, you know we are doers. We use the phrase “power touristing” to describe our sightseeing habits). We were on a mission to find a boat to take us on a private tour to all of the stunning grottos as soon as we made it off of the ferry. We quickly learned that this was an easy task and found a quirky, little Italian man who set us up with just that. He insisted on carrying my bag and even took my sunglasses out of my hand to clean them off. We decided on a 2-hour tour around the island for 150 euros and off we went (this was a very basic boat that fit our needs perfectly. Much more extravagant boats are available for rent if you are willing to spend the money or have a big group to split the cost)! As our skipper began to head out to sea on our thrilling adventure, I couldn’t help but notice how spectacular the deep, blue water was. I probably took 100 pictures of the water (how many pictures can one person take of gorgeous water? A LOT if you’re me, and even more if you’re Eric). We visited the White Grotto, the Green Grotto, the Faraglioni Arches (three towering rock formations that jut out of the Mediterranean), the Punta Carena Lighthouse and a little cave with what looked like a heart inside of it. The grottos were beyond spectacular. The glimmering, iridescent Mediterranean water changed from one exquisite color to the next as the sun glistened upon it. The White Grotto was our first stop. According to the skipper, this was the best spot for a quick dip. Eric jumped right off the boat, but I opted to stay dry and warm. I still freeze in 75-degree weather (24C for you Canadians out there). The Green Grotto was the most enchanting of the two in my opinion (but don’t get me wrong, the White Grotto was magnificent). 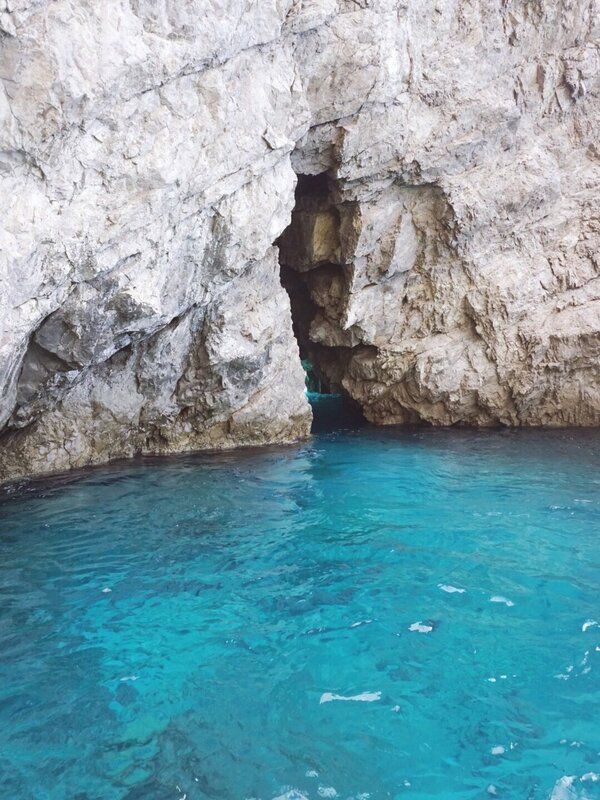 The beauty of the turquoise blue water was grandiose in nature. If I could explain it into words for you, it looked as though someone had dropped dye into the sea to create the most amazing hue of blue. I could not fathom how it could possibly be real. We opted out of stopping at the Blue Grotto, which is the most sought after grotto by tourists. The wait was at least an hour, and because of the time of day that it was, there wouldn’t be enough sun to hit the water to see it in all its glory. 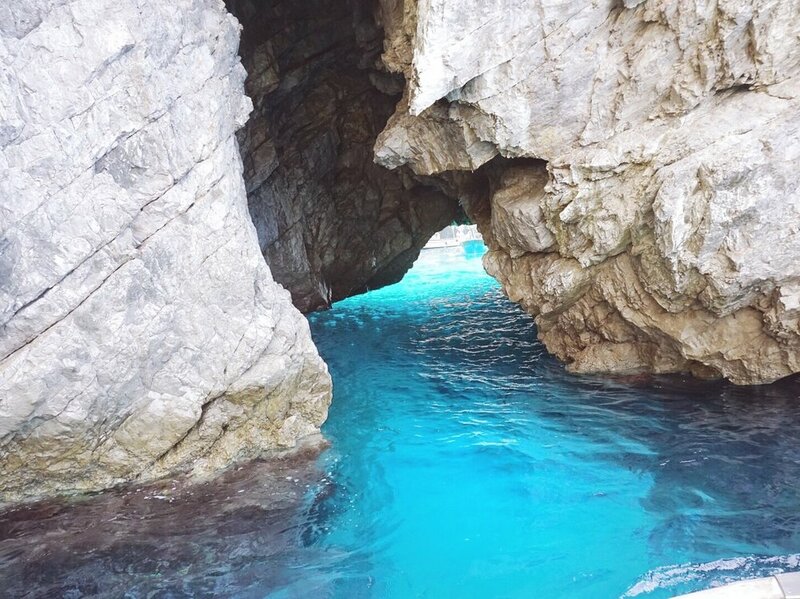 If you plan on visiting the Blue Grotto, I would suggest heading there in the early hours of the day so that the sun lights up the magical water just right. Instead we headed to the Faraglioni Arches (it’s good luck to kiss as you go through them! I will use any excuse to kiss my husband #PDAalert), the Punta Carena Lighthouse (anyone else have a thing for lighthouses?) and the cutest little cave that had what looked like a giant heart carved by mother nature in it (the girly girl in me was crushing hard on this heart). Once we finished our private boat tour, we were on a mission for the best grub and a vibe to match. The foodie in me is always on the lookout for all-star restaurants. A lovely friend of mine recommended that we check out La Fontelina Beach Club. The club was located on the other side of the island, and after asking a couple of locals, the best way to get there was to taxi to a particular spot where La Fontelina does pick ups via boat. Leave it to me to want to go to a place that is the hardest to get to *face palm. This magical beach club, which is actually carved out of rocks, is only accessible by boat, how cool is that?? In a dream world I would take my sweet yacht right on over, which many people do. P.s. if this is you reading, who are you and can I have your life? Guyyyys, La Fontelina did not disappoint. This place is what dreams are made of. 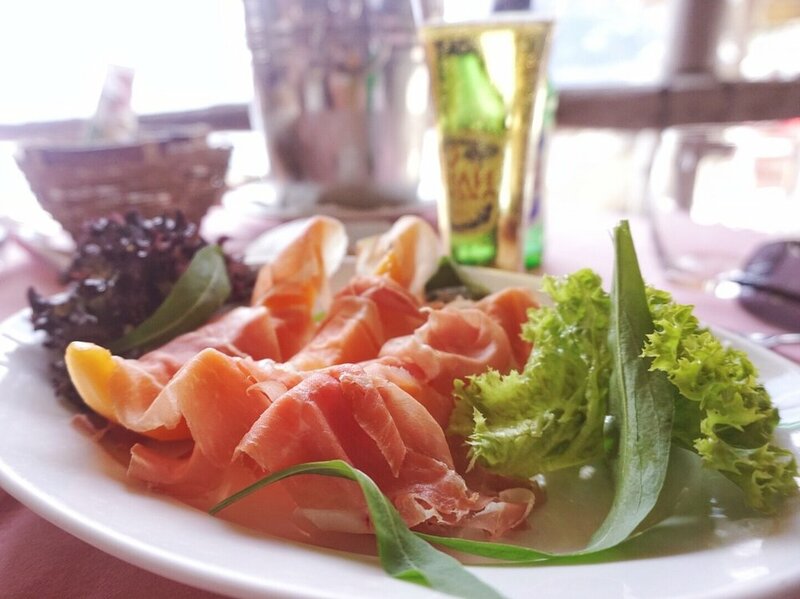 Not only is the ambience beyond cool…the views are breathtaking and the food is out of this world! When Eric and I dine out, we almost always share everything so that we can try as many things as possible. I often have a difficult time deciding on just one dish to order so this makes things a lot simpler. Why get one dish when you could get 2? Or 4 if you are Eric (who eats 3 of them) and I. Do any of you do this with your significant other? Luckily him and I have the same taste, and are adventurous with our eating, so it is never challenging to agree on what to get. We decided on prosciutto melon and eggplant Parmesan as our appetizer, which were both bomb! The prosciutto melon was the perfect balance of sweet and salty and the eggplant parmesan was cooked to perfection with just the right amount of cheesy goodness. For our entrée, we had a seafood risotto, which was to die for, and mussels that were so tender and tasty. All of the seafood was incredibly fresh and made to order. I would highly recommend checking this place out. Your taste buds will not leave disappointed (but your wallet might be a little unhappy)! Obviously I have to talk some fashion. For this little getaway I chose to wear my Show Me Your Mumu Charleston Romper. I can’t even tell you how many compliments I received while wearing it. Not only is it so comfortable, it’s also extremely versatile. 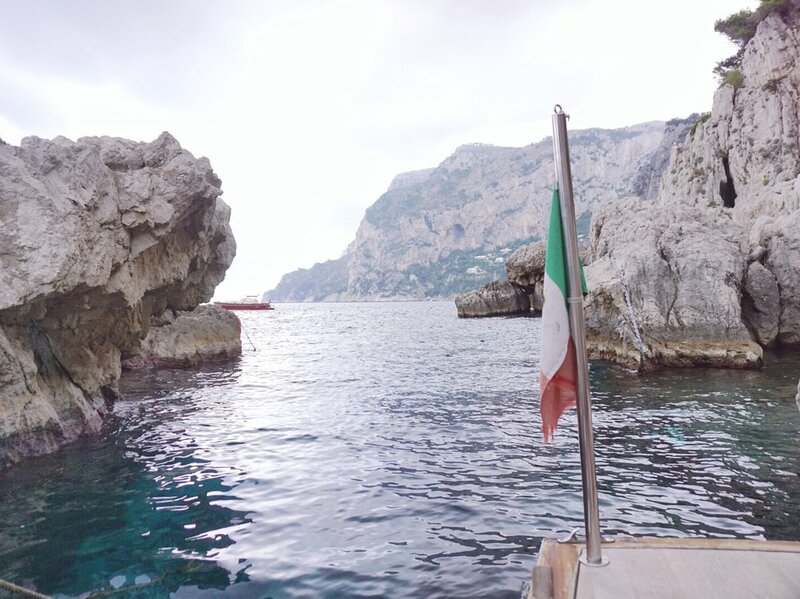 It transitioned seamlessly from our magical boat ride in Capri, to the ever-so-chic La Fontelina and perfectly into happy hour at the extremely trendy Franco’s in Positano. What I love about rompers is that you don’t have to think about matching your bottom to top, and you get a whole outfit for the price of one (this is how I justify my excessive romper collection to Eric for the record…does anyone else justify their purchases this way? lol). After a great day covering the Island, we headed back to the ferry. Instead of a round-trip back to Sorrento, we booked our return ferry to one of our favorite destinations on our honeymoon, Positano on the Amalfi Coast. 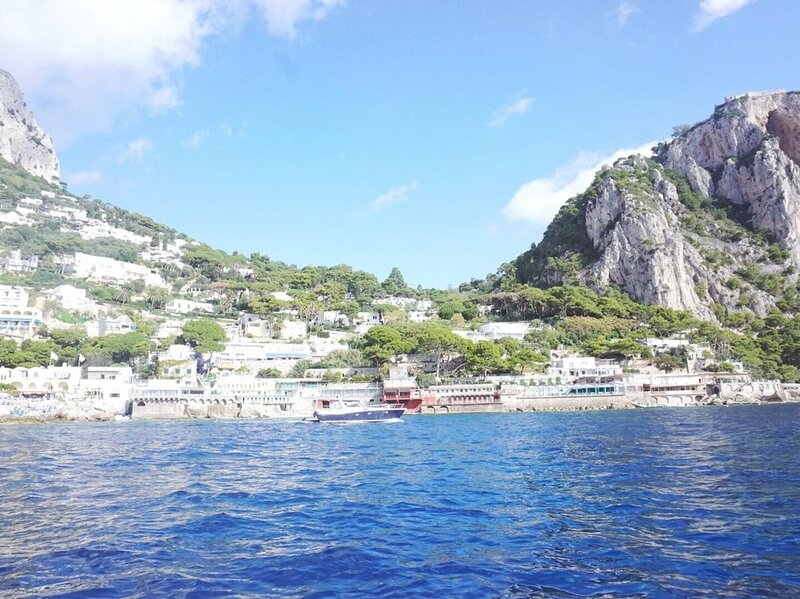 Keep following Currently Chelsea if you want to hear all about our time in Positano, which will have its own post! You can subscribe below to stay current with me!